Here are my (so far) five blocks for the Block Lotto this month. These were fun to make! First I did one block to test things out, then I did two, and then four in the same amount of time (around 30 minutes each batch). The duplicate red ones (not pictured) will be sent for use in a charity project that is collecting red and white blocks that are 8.5 inches unfinished. Blogged here. Having the fabric ironed and cut really helps speed the process up! 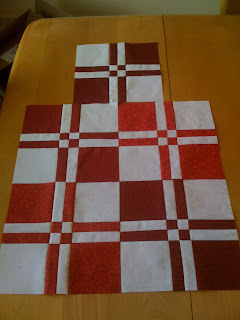 These D4P blocks will be really fun to place in a quilt. Controlled colors really make it nice too. My fingers are crossed! I sent my February BL hearts off to Wendy today. Those blocks would make a good quilt for a man or a woman. I’m looking forward to seeing what you come up with!